In the year to end August 2017 new build house prices rose on average by 5.3% across the UK which is down on last year’s figure of 6.0%. If Greater London is taken out of the calculation and we take a crude average of the remaining regions, then the average house price growth is 4.3% compared to a figure of 4.6% last year. In common with other indices, we are seeing a ripple effect as the heat has now come out of the London market and a gentle price wave moves out across the regions. 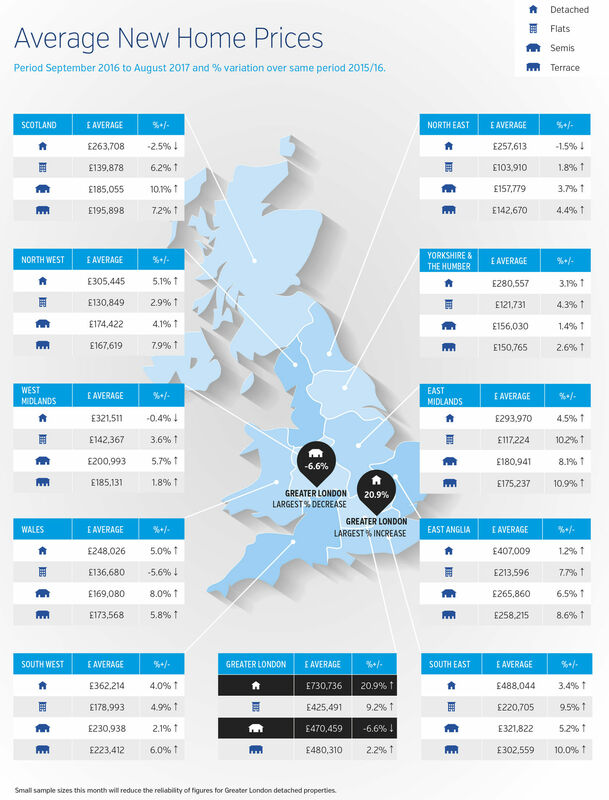 All regions are seeing some amount of house price growth. The South East of the country – South East, East Anglia, East Midlands & Greater London should all be enjoying a relatively buoyant housing market (albeit that prime London markets are now reported to be declining). For other areas, and ten years on from the market crash, there is slow but steady growth and prices are edging above the 2007/8 levels. As noted in previous months’ commentaries, people are becoming more cautious about making big purchase decisions.